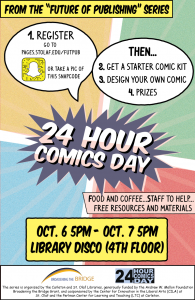 As part of the Future of Publishing Series, St. Olaf will host a 24 Hour Comics Day challenge October 6th and 7th, 2017. 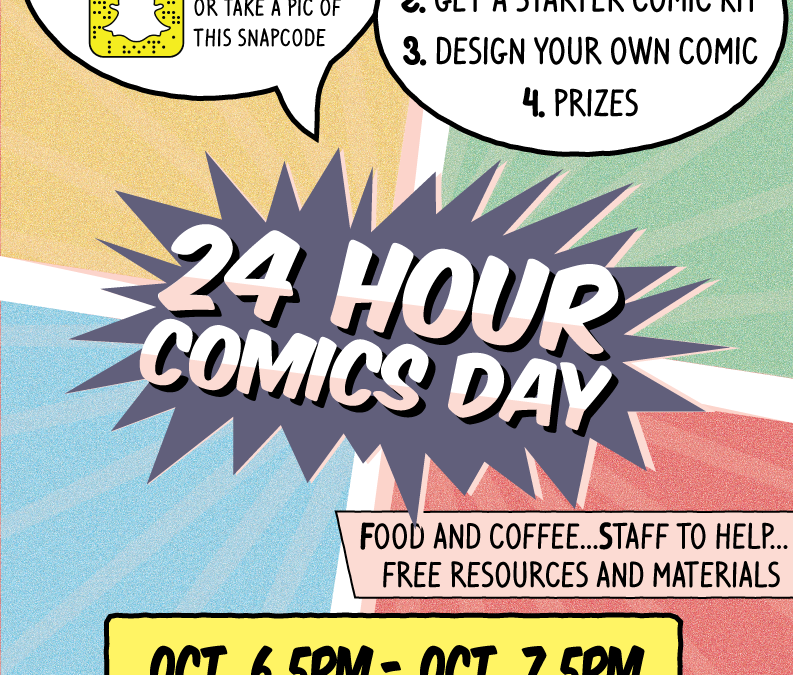 The basic premise of the challenge, an annual international event celebrating sequential art, is: complete 24-pages in 24-hours. To aid in this grueling task, we’ve provided some helpful resources – but first: you must register! Register (form forthcoming! ), and receive a kit to start you on your way: some supplies from The Sketchy Artist in Northfield. Find some friends and make your plans to work, draw, and support one another. If you are at Carleton and need a ride over, transportation will be provided – details here. While you’re welcome to work anywhere, we invite you to join in the spirit of the day and meet us at our launch: 5pm Friday Oct 6th, the Digital Scholarship Center at St. Olaf (DiSCO) in the beautiful Rolvaag Memorial Library 4th floor. Here you’ll find additional resources for your efforts: collections of graphic novels and inspiring, informative books on sequential art, light boxes to aid in tracing and drawing, a copy-stand and scanner to digitize work, Wacom tablets and styluses, and computers and software if you need it – the DiSCO has the Adobe Creative Cloud Suite ready on all its computers.